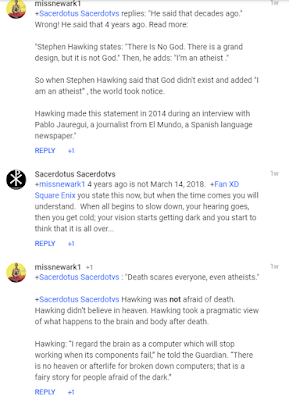 Sacerdotus: Is Stephen Hawking in Hell? It has been almost a full week since the world has lost one of the greatest scientific minds in post-modern history. 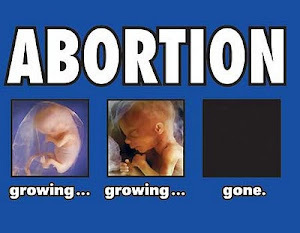 Many people have felt the loss, including myself. 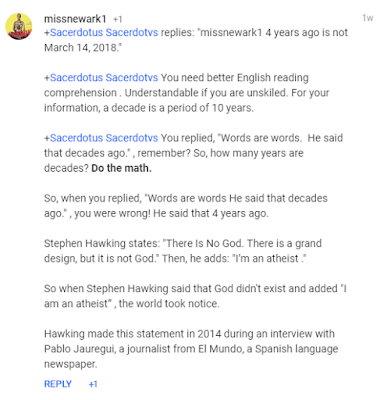 Stephen Hawking was an idol to me during my atheist days and into now as a Catholic. 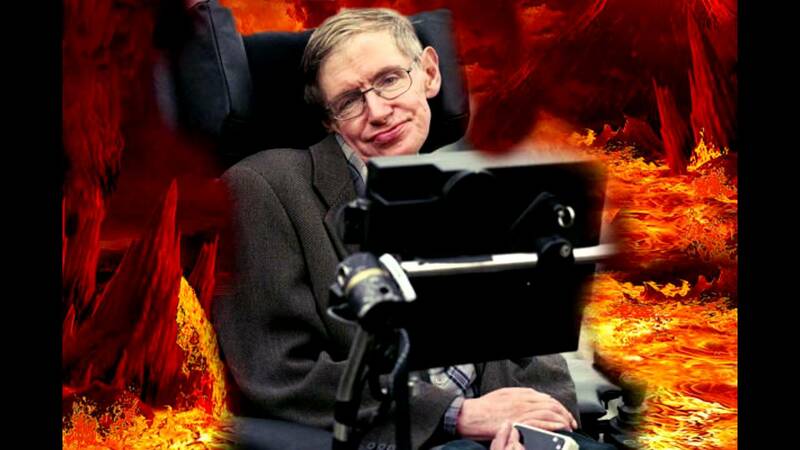 While we did not agree on everything, I still appreciated his person and contribution to physics. 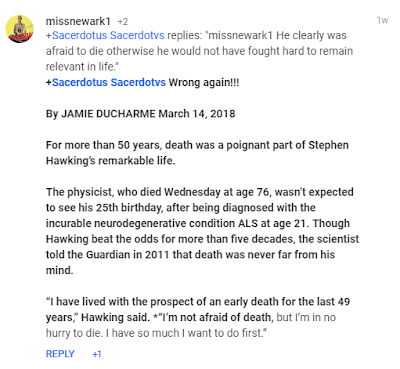 Moreover, Hawking was a big inspiration because of his physical condition. He developed ALS at an early age and given just two years to live. Obviously, he defied that short expectation of life. In my opinion, God kept him here to help discover new things about His creation. His life in a wheelchair using a robotic voice to communicate showed to me that life is special. Human life is unique and can overcome many things. I remember taking a philosophy course dealing with disabilities and bringing him up during discussions about the worth of the disabled. As a fan, I always put him on a pedestal in the class by reminding fellow students that this man was literally frozen in his body and kept working and making discoveries! Human beings are prejudicial creatures. We love to judge others and prejudge. Usually, when we see someone in a wheelchair or on crutches, we assume the person is sick, weak; some of us may see the person as useless or not even a person. 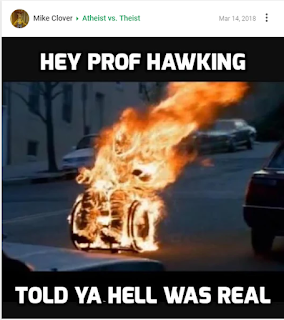 Hawking proved everyone wrong. The disabled do matter. They are persons with dignity capable of many things. 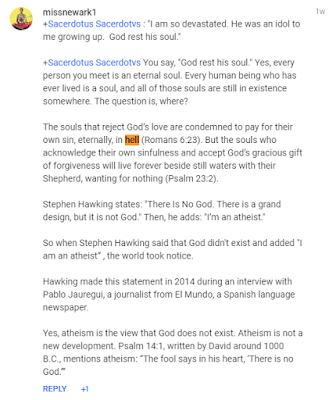 The Holy Father was obviously referring to God's mercy when referring to atheists and even gays. These are two groups of humans who have been targeted by Christians and others for centuries with claims of damnation. 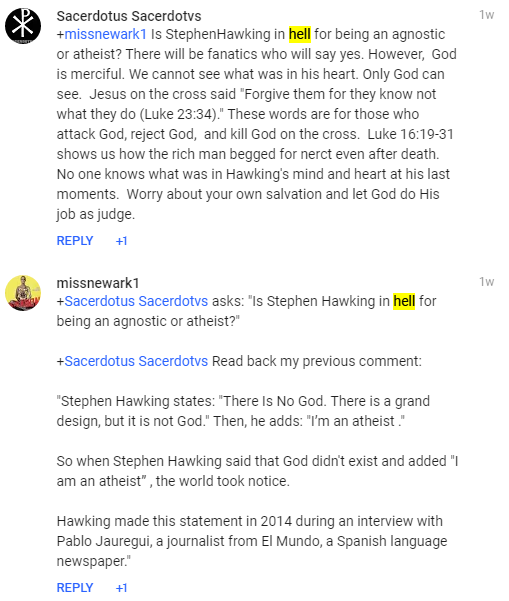 Atheists today even complain to me about how pastors have condemned them to hell. Family members have also joined in the spiritual abuse, as I call it. 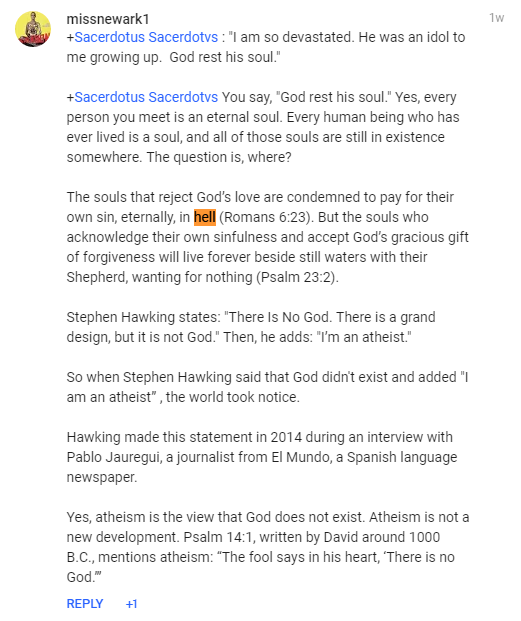 While rejecting God is a mortal sin, this does not necessarily mean that an atheist will go to hell. 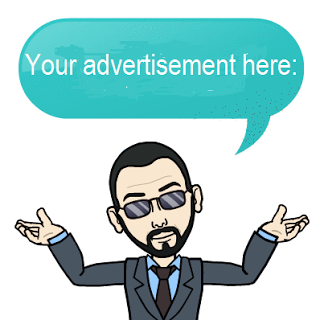 You may be wondering what I am talking about. Let me explain. 1260 "'Since Christ died for all, and since all men are in fact called to one and the same destiny, which is divine, we must hold that the Holy Spirit offers to all the possibility of being made partakers, in a way known to God, of the Paschal mystery. '63 Every man who is ignorant of the Gospel of Christ and of his Church, but seeks the truth and does the will of God in accordance with his understanding of it, can be saved. It may be supposed that such persons would have desired Baptism explicitly if they had known its necessity." 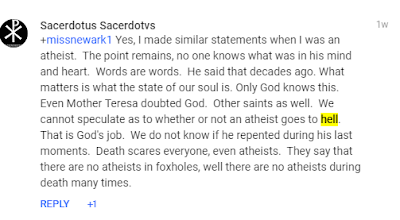 So an atheist who is good and at death asks God for mercy may, in fact, be saved and end up in purgatory or possibly even heaven. 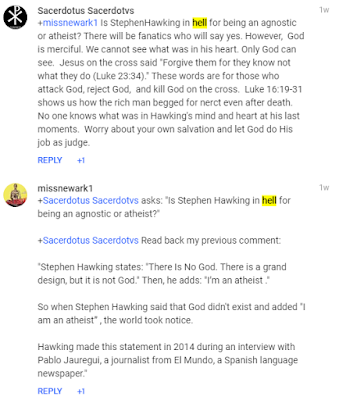 This is why I stressed to the person on Google Plus that we cannot condemn Dr. Stephan Hawking to hell simply because he claimed to be an atheist or make anti-God or anti-religion comments. He may have believed those statements or he may have just said them because maybe he was angry over his disability. Who knows! The fact of the matter is that we do not know what was in his heart or mind. His past statements are irrelevant. 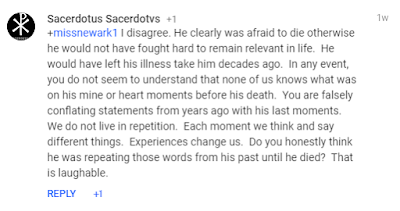 What matters is what was in his mind and heart as he breathes his last breaths. 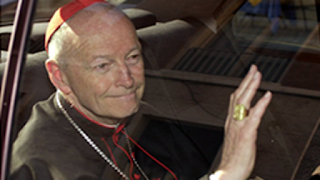 This is why not even the Catholic Church has made any pronouncement about who is in hell. We just do not know. While the Catholic Church is the normative means to reach salvation in Jesus through the adherence to her teachings and Sacraments, this does not mean others outside of the Church are automatically condemned. You will not even find the Catholic Church claiming that Hitler is in hell. This is not the Church's job. God is merciful. Pope Francis has been reminding the world of this ever since he took the Chair of St. Peter. 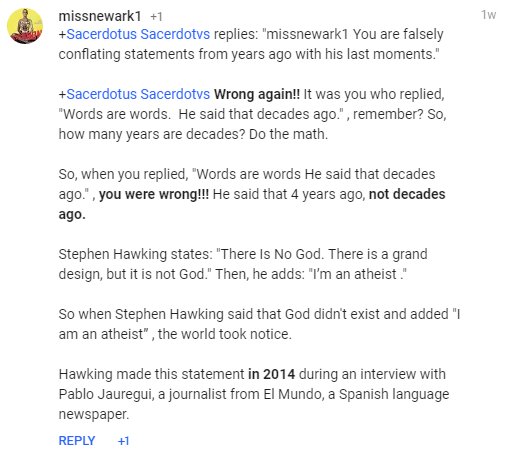 An atheist is not shunned from God's mercy. We see the case of St. Dismas or the "Good Theif" in Luke 23:32-43. This man was far from God and was nailed to the Cross alongside Jesus. He asked Jesus for forgiveness and Christ promised him that he would be with Christ in paradise. This man probably never went to Synagog or prayed, yet in his last moments, he was saved by Christ. 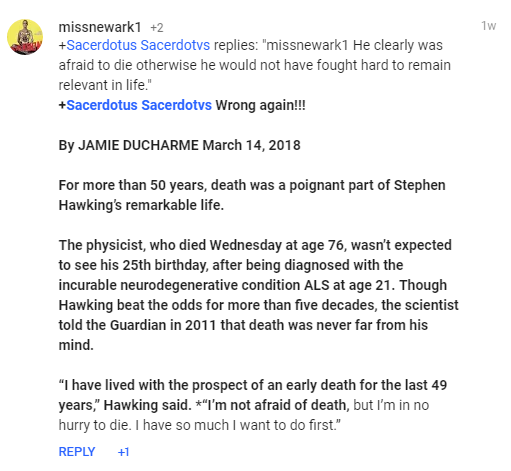 An atheist has the same opportunity, even at death. 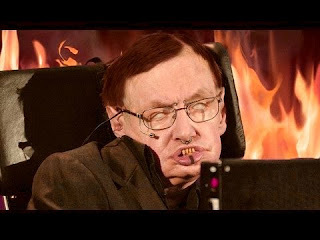 Some news outlets have reported that a Protestant website author said that Hawkins was conceived of Satan in order to counter the late Reverend Billy Graham. 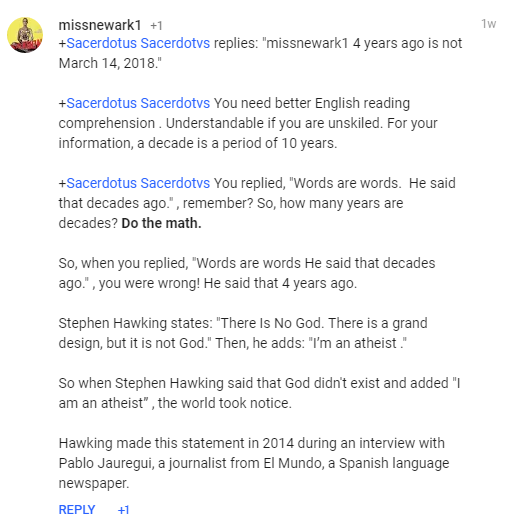 This individual "figured" this out by the years both were born. 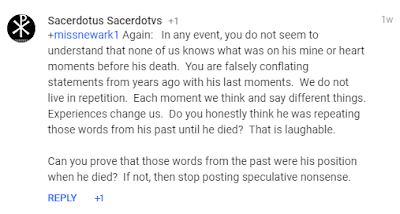 This, of course, is hogwash and shows that this Protestant may have some psychological problems. Furthermore, my fellow Catholics are not so innocent either I am afraid to state. 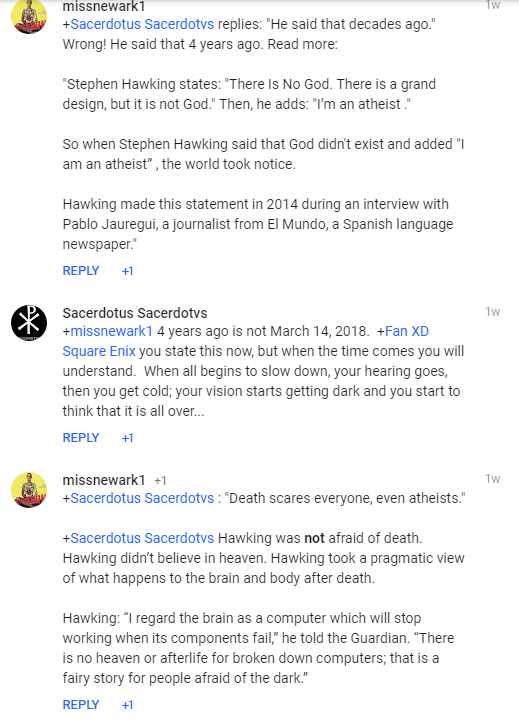 Some private Catholic Facebook groups and organizations which are not affiliated with the Catholic Church have claimed that Hawkins told the pope that "he believes" using his robotic computer voice. The website Snopes called the story false. 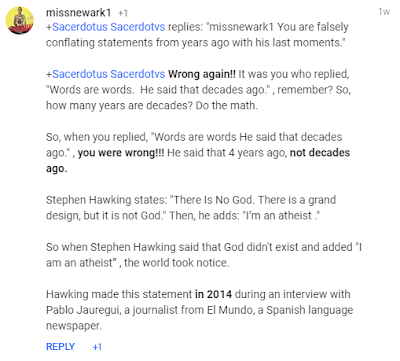 Again, we simply do not know what happened between Hawking and God! I hope and pray for the best and try to think positive. That is my job as a Catholic and Catholic Evangelist. We must pray for those Christians who live their lives condemning others. They cannot see reality because of the log in their eyes. 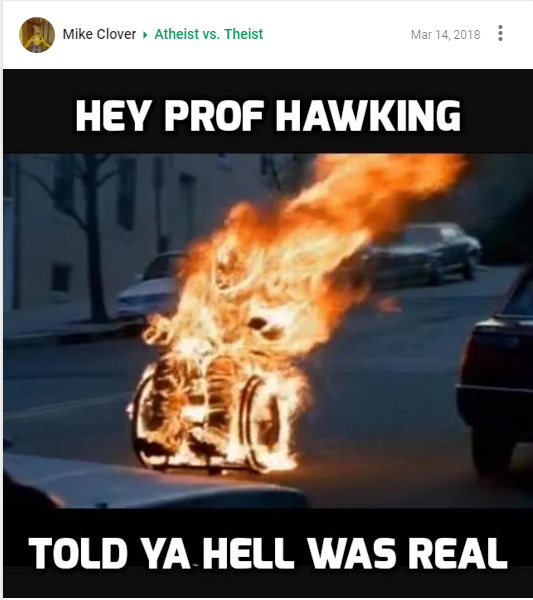 Is Stephen Hawking in hell for being an agnostic or atheist? There will be fanatics who will say yes like the person who posted this below on Google Plus or those who tweeted the tweets above, not to leave out the many other sites and Facebook posts out there. However, God is merciful. We cannot see what was in Hawkins' heart. Only God can see. Jesus on the cross said, "Forgive them for they know not what they do." These words are for those who attack God, reject God, and kill God on the cross.